A few weeks ago, I thought it would be fun to post my top 10 favorite photos I have taken of Bennett in 2010. After I decided to do it I asked a few of my blogging friends who love to photograph their children to join me. Amber's Articles (me, of course), Jhen of From Here to Eternity, Courtney of Click It Up A Notch, Mandy of a sorta fairytale, Sarah of Naptime Momtog, and Chelsey of The Paper Mama hope you will join us in posting your top 10 favorite photos. B came into our lives on March 28th and changed our lives forever. I remember being so concerned about his head shape when he was born, but it only took a few days for it to become perfectly round. He had so much hair and the most beautiful red lips. How can you not love this photo? B was a month old here. 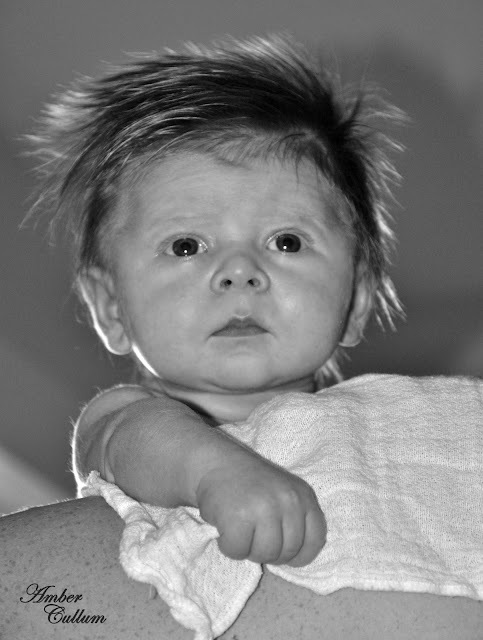 He had the most fantastic, wild hair I have ever seen on a baby with the most perfect comb over. Since B was born I have learned so much about photography. So many of my early shots are blown out by the flash; however, this is STILL one of my favorite pictures of Bennett. He was just beginning to use the bumbo chair and would often slump down when he got tired. 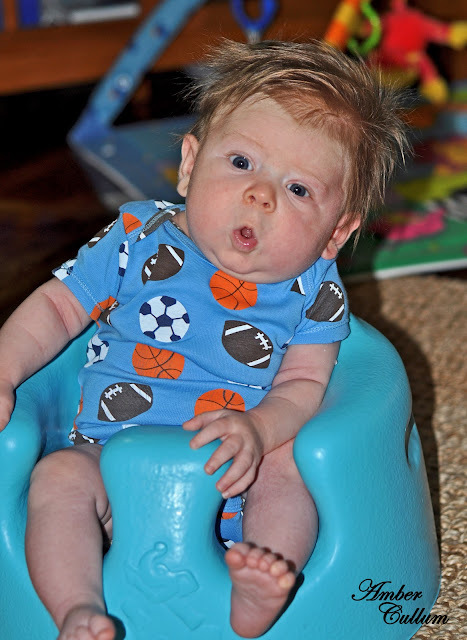 When I first put him in the chair he LOVED it and always made funny faces. 4. Birthday wishes for papaw. The above picture is evidence enough that snapshots are just as needed and fun and memorable as the technically correct photos. This picture is, probably, my favorite of ALL. My grandfather's 88th birthday was in July, so I took 3 pictures of B holding the signs Happy, Birthday, and Papaw. We made a card and sent it to him. He passed away less than three weeks later. The card was still hanging on his mirror when I was home for Christmas. 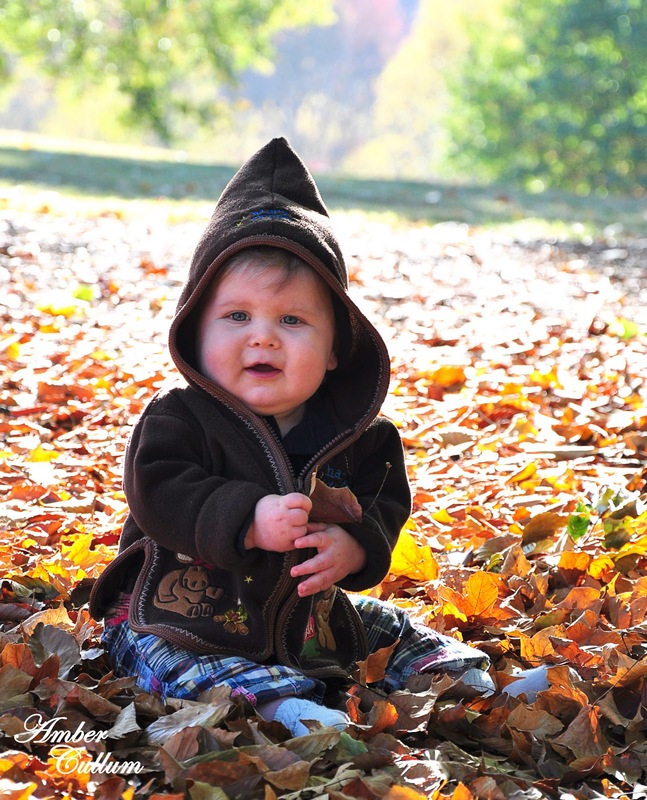 My son will always bear my papaw's name: JAMES Bennett (and for that I am thankful). B was a little shy of 6 months old here. He couldn't sit up on his own, so I decided to put him in a basket on the kitchen counter where I could use my kitchen wall as the background. This was one of the first times I shot on manual mode and really felt I was beginning to gain an understanding of natural light. I love B's baby blues and sweet facial expression in this photo. B was playing on the couch when I captured this shot. It was a complete surprise, as I quickly adjusted my settings while holding onto B's back, so that he wouldn't fall over. I took a few quick shots and BAM ended up with this. It really captured one of B's expressions that I still see on a regular basis. I feel like I can see the wonder in his eye. B was 6 1/2 months old here. This was the first time he tried to feed himself banana. I don't know if you saw the video, but it was hilarious. 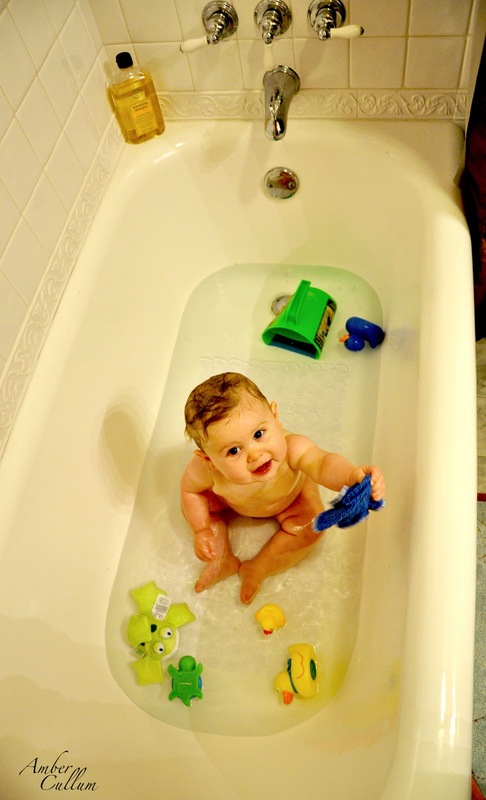 It is so fun to watch B play in the bath. I have many wonderful memories of playing in the tub with my sister when we were little. We would play for a while and then we, typically, wanted our dad to help us wash our hair. Sam and I both enjoy Bennett's bath time so much that I wanted to make sure I captured him playing with some of his favorite toys....thus far. This photo was taken at the beginning of December. It is one of my favorites, because it shows how much better he has gotten with feeding himself. I love all of the egg yolk that is covering his bib. Plus, it is a great picture of what was left of the black hair he had when he was born (look at the tips). And just look at those big blue eyes. 10. I'm a little stinker. B has a new obsession with his tongue. He loves to stick it out and make funny noises. I love this picture because it captured his personality.....right now....at 9 months. 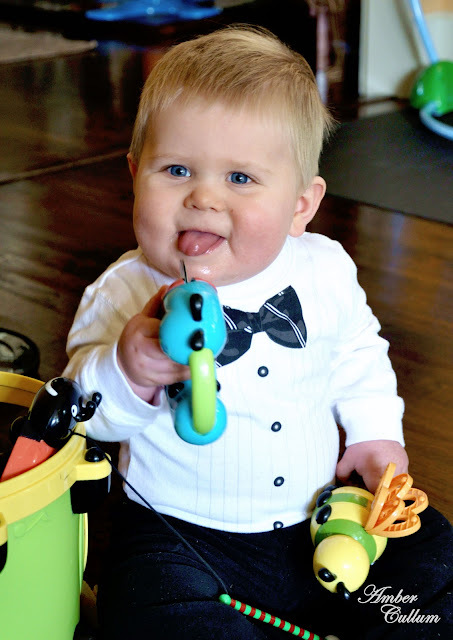 He loves to shake things, stick out his tongue, pull toys out of containers, among other things. I am sure I am not alone when I say I struggled to only choose 10 photos to post. I originally narrowed it down to 33, then struggled to discard the extra 23. Therefore, I am breaking my own rule and posting a few honorable mentions. I took this photo for Bennett's 4 month post and I think it is hilarious. Plus, this is one of my husband's favorites, so he didn't want me to leave it out. There are many reasons why I miss Kentucky, but I miss it most during the fall. I was so excited when we made a trip to Kentucky in October and Bennett was able to play in the leaves. I love how sweet he looks and how he is grasping a leaf in his right hand. B was exactly 2 months old when I took this photo. We had a rough 2nd month, so I enjoy looking back on this photo, because I think more about how sweet he was versus how difficult and long his infant days were. 14. Check out my suit. I couldn't resist adding this one to the mix after the fun we had in the snow over Christmas. Bennett loved sledding. He also loved watching all of us throw snow balls at one another. So, I guess I should have made it a top 15 of '10 post. It has been a blast to look back through my 2010 archives. I was reminded of many things I had forgotten. It is amazing to think about how much Bennett has changed and how much more he will change by the end of 2011. I hope each of you will consider linking up your top 10 (or more) photos of your children in 2010. You can link up through Sunday, on any of the blogs I mentioned at the top of this post. Be sure to check out all of the links. Bennett's SOOO cute! I love his wild hair! Both my babies came out with very little hair and I despaired of Z ever having enough hair so that people would know that she's a girl! So adorable! Love his hair in the second photo. I really loved them all I can see why you picked so many. Absolutely precious! I love this idea. I'm going to get to work on mine. That picture of him in the tub is so neat from that perspective. His hair is just too much! What a doll, Amber. Oh my goodness, he is too cute. So adorable. I am going to join in later...thanks for hosting! So freakin cute! I love them all. 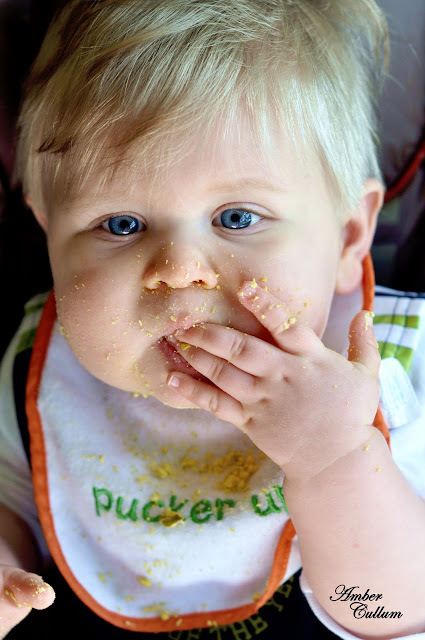 That Yummy photo is adorable! I'll be posting mine tonight ... have to go through all my 12 CDs from this year to pick out my favorites. Such great pictures! It's so hard to pick just 10, isn't it? Especially when he is as adorable as your little man. love all your pics..... especially bennett at one month w all that hair!! I love every one of these. I think #2 and #9 are my favorites. I can't believe it's been 9 months - in many ways it really does seem like he's always been part of your family. I'm so thankful that we've been able to share in this special time of each other's lives. Baby boys are the best! How cute is he?! I seriously love his hair, and I can see why you wanted to pick so many! I'm a new follower and can't wait to read more about you and your precious family! He is soo cute! I love the one in the bow tie! I saw your blog through this link up and now I'm your newest reader. :) Such a great blog! Happy New Year. I love all of these - it's crazy how much he's grown. Those are all so great! LOVE the crazy newborn hair! SO adorable! Thanks for sharing and giving us the oppertunity to share! Me and my little point and shoot, and pictures of laska the love kitty are not quite prime time material. But I loved all of your shots. That boy will be graduating college before you know it. And you have all these memories locked away. God Bless you and yours. If this was a best hair contest, your little guy would have won for sure! :) He's so cute! I cannot believe his hair! It is incredible to see how much he changed in all of these pics and how blonde is hair is at the end. LOVE, LOVE, LOVE the idea of taking the Birthday pics for your Paw Paw. How precious. OH.MY.GOODNESS! You're little guy had the CUTEST stack of hair on his head as a newborn! I love your pictures! Love the basket one with the green background and the first photo! SO GOOD! These are all so great!! If I HAD to choose one my favorite one is the one with his wild hair in the beginning. Who could resist him? :) Would love to have linked up bt our computer is being repaired as we speak, so I'm reading this by phone. See you tuesday sweet friend! Oh my I love all his hair !! WOW he is seriously cute/adorable/handsome! So hard to pick favorites from a whole year but you got some GREAT ones! oh my gosh such adorable photos! Love his hair! Great pics. thanks for this linky, I love it! I love all of these! Seriously he is soooo soo cute. I love his hair it's my favorite!! Love Love Love this idea you are genius! Thanks for stopping by! I will be following back :) I have to say your baby is just adorable! I love his WILD hair! It's crazy to see how much they change! Great photo's...this was a lot of fun! You're right - I think our sons have an equal love for food! Maybe it's related to how much hair they have?! OMGoodness he is the cutest thing I have ever seen! I adore him :] This was SUCH a fun thing to do. Thank you for sharing! He ia absolutely adorable! His hair is too, too fun! Thanks for sharing! he is so precious! i've enjoyed looking at your blog today! So happy that i found you!! The shot in the leaves is just beautiful too! Oh my! I had no idea Bennett was born with so much hair!! I can't show these picture to Emma, she would be jealous :O) I adore the black and white one with his crazy hair! 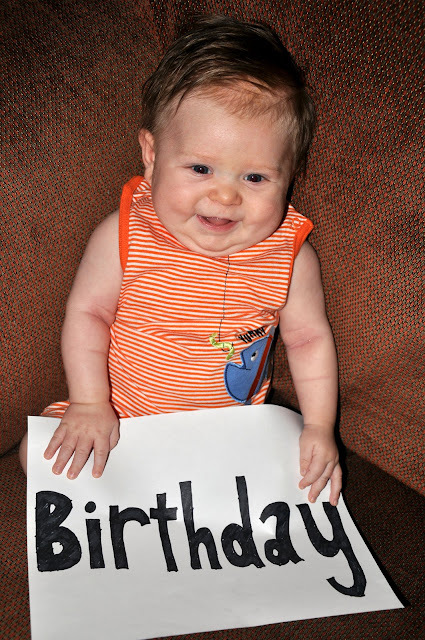 What a precious story behind the "birthday" sign photo. The profile shot is fabulous! Don't you love it when you accidently capture something wonderful! Oh my gees. I love that hair! what a cutie!